Normally a myCRED transfer of points are instant. This feature however allows you to put certain users transfers on hold for a set number of days. The amount the sender nominates will still be deducted from their account but it will not be paid out to the recipient until the timer has reached zero. An administrator can always override this and payout a pending transfer at any time or select to refund the points back to the sender. You can also select to exclude users based on their WordPress role in which case transfers will go through instantly. This feature requires myCRED 1.7.6 or higher in order to support Transfer Messages. First make sure you tick the checkbox to enable this feature. Next you need to set the number of days transfers are put on hold along with the refund template you want to use, should you ever select to refund a pending transfer. 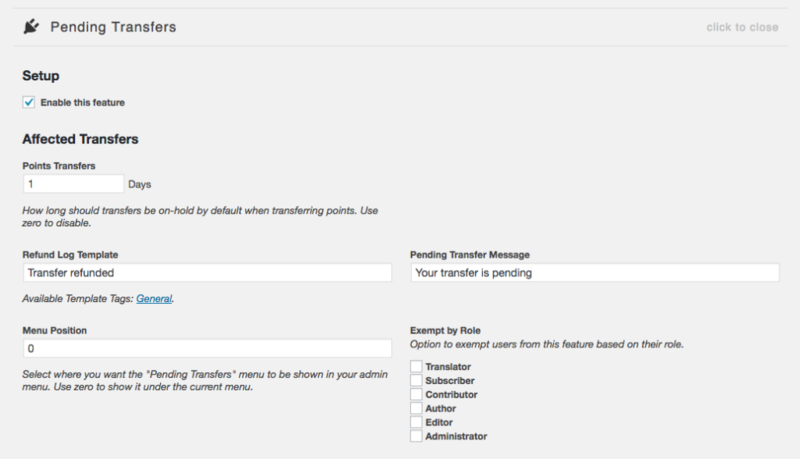 By default, the plugin will add in the “Pending Transfers” menu in your admin area outside the myCRED menu. You can select to move it around by changing the menus position. The lower the number, the higher up in the menu it will be displayed. You can also set this to -1, in which case the menu is moved inside the myCRED menu. Finally you can select to exclude certain users based on their WordPress role. Transfers by excluded users will not be put on hold and delivered instantly. You can select to payout pending transfers at any time or select to refund a transfer. On the “Pending Transfers” page in your admin area you will find all transfers that are currently pending. Here you can see who sent the transfer along the recipient, the amount of points that are being transferred, the day it will be credited and a unique ID. Hovering your mouse over one of these pending transfers will reveal the actions you can take for each item. Pending transfers go hand in hand with Transfer Fees. In this screenshot both features are enabled. You can select to refund a transfer, in which case the sender will receive the original amount they sent back into their account. Alternatively, you can select to credit the transfer now, instead of the date set. The plugin gives you access to the mycred_pending_transfers shortcode, which allows you to show a user any incoming or outgoing transfers that are currently pending. Please consult the shortcode documentation on usage.